Ken Lingenfelter’s immaculate collection is located in Brighton Michigan and on Sunday October 14th, Ken will open the doors to his sprawling garage that houses some of the most powerful, most unique and most expensive cars built and sold in the last 80 years. While the high performance tuning shop/car builder that wears Ken’s last name is best known for their involvement in General Motors products, his collection extends well beyond GM vehicles. Mind you, a large chunk of the 200 cars in the Lingenfelter Collection are either super rare or ultra high performance GM products (many of which have been tuned by Lingenfelter Performance) but his garage also plays home to vehicles like the Bugatti Veyron (which Ive seen Ken driving around the Metro Detroit area), the 1965 Ford Mustang GT Fastback, the 1970 Plymouth AAR Barracuda, the 2005 Ferrari F575 Super American, the 2009 Nissan GT-R and the 2008 Lamborghini Reventón are just five vehicles that show the scope of his fine taste in high performance vehicles. Basically, if you can name a high performance car – Ken Lingenfelter probably has one. Or Two. Or Six...teen. This Sunday will also bring about the formal introduction of some new additions to the Lingenfelter collection including the Lingenfelter COPO Camaro which has turned out a best quarter mile time of 8.64 seconds at 159.12 miles per hour. This Sunday marks a rare chance for automotive enthusiasts to visit Ken Lingenfelter’s collection in Brighton, as he only opens his doors a few times a year to select groups and best of all – the proceeds of the event will be donated to help fund breast cancer research. Sadly, Ken knows the impacts of this terrible disease personally having lost his sister to breast cancer so he will use his massive collection to help support the cause this weekend. I should point out that admission to view the Lingenfelter collection is free to everyone but donations will be accepted. 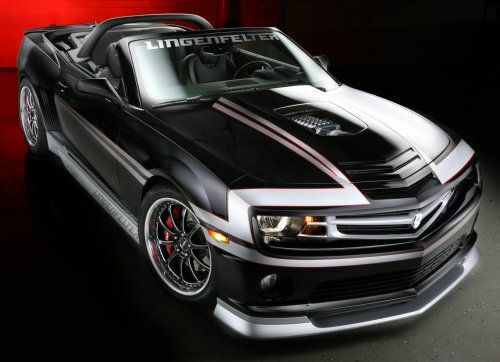 The Lingenfelter collection is located at 7819 Lochlin Drive in Brighton Michigan (48116). This open house is a rare chance for automotive enthusiasts to see some of the most exclusive and highest performance vehicles in motoring history. This is also a great chance for gearhead dads to introduce their little gearheads to cars that are so rare that they are likely to never see one anywhere else in the world. The open house this Sunday runs from 12 noon to 5pm. In case the few cars mentioned above or the chance to help breast cancer research are not reason enough to make a trip to Brighton Michigan, feast your eyes on the complete list of vehicles currently in the Lingenfelter Collection. Seriously – scan through the cars (arranged by year) and look at the combination of classic high performance and modern super-exotics. I’ve taken the liberty of highlighting some of the most impressive cars on the list (of course, in my opinion). The gallery above on the right has pictures of just five of Ken’s cars and you can see these examples more clearly by clicking any of the thumbnails. 1987 Porsche 911 Turbo "Slant Nose"
2000 Ford Mustang Cobra "R"
Yeah…it’s amazing. Clearly worth the drive to Brighton Michigan on Sunday. Don’t miss out!